Prototype: German Railroad, Inc. (DB AG) class 187.1 electric locomotive (TRAXX AC 3). Built by Bombardier as a regular production locomotive from the TRAXX 3 type program. 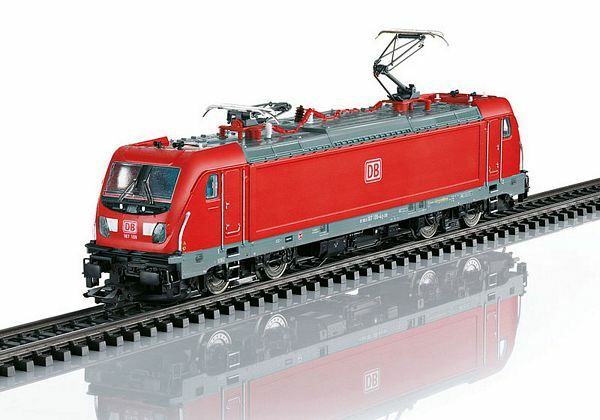 Model: This electric locomotive is constructed of metal and has an mfx digital decoder and extensive sound functions. It has a special motor, centrally mounted. 4 axles powered by means of cardan shafts. Traction tires. The locomotive has triple headlights and dual red marker lights that will work in conventional operation and that can be controlled digitally. The headlights at Locomotive End 2 and 1 can be turned off separately in digital operation. When the headlights at both ends are turned off, then the "Double 'A' Light" function is on at both ends. Warm white and red LEDs are used for the lighting. There are 2 mechanically working pantographs (no power pickup from catenary). Length over the buffers 21.7 cm / 8-1/2". Completely new tooling for the modern Bombardier TRAXX 3 electric locomotive. Version with imitation flex panels on the sides of the locomotive. A DC model can be found in the Trix H0 assortment under item number 22278. T22279/T22278, M36630/36631 – Class 187 (Traxx AC3) With the road number 145 001 ADtranz (currently Bombardier) presented the first unit of a new locomotive generation on July 10, 1997 that later developed into the TRAXX family. Upon being delivered, it was impossible to deny the close relationship of the class 145 units to the class 101 express locomotives. Due to the lower maximum speed of 140 km/h / 91 mph, the class 145 locomotives were equipped with a less costly drive system suspended from the axles with built-in three-phase motors. The monitoring of the wheel sets in a truck were controlled and supplied with power jointly with a rectifier. The longitudinal forces between the trucks and the locomotive body were transmitted by low mounted drawbars and pressure bars. The DB put 80 units into service by the end of 2000 and another 31 units as the class 146.0 for regional passenger service. ADtranz presented the dual system locomotive, road number 185 003 (TRAXX AC1), on July 11, 2000 as an improved version that could also be used on catenary for 25 kilovolts / 50 hertz. Essential changes concerned the transformer, the roof being lowered by 105 mm / 4-1/8 inches, being equipped with train safety technology for different railroads as well as the installation of four pantographs. Delivery of the regular production class 185 took place in the first half of 2001. In addition to privately owned transportation companies, SBB Cargo also placed these units in service as the class 482, BLS Cargo as the class 485, and the CFL as the class 4000. Starting in 2005, the DB took delivery of another reworked version of the class 185, beginning with road number 185 201, with an altered locomotive body improved for crashes. A run of 206 units were delivered by September of 2010 – the TRAXX AC2. The classes 146.2/3 followed for the DB regional passenger service. Privately owned transportation companies, SBB Cargo (class 482.2), and the Hungarian MAV (class 480) also purchased these units. The TRAXX MS2, designated as the class 484 for SBB Cargo, followed as a dual system variation for DC and AC systems (Italy/Switzerland). The four-system locomotive TRAXX MS2e came into existence starting in 2006 for all of the commonly used current systems in Europe. This locomotive includes the twenty DB units designated as road numbers 186 321-340, the class 486 of BLS Cargo, the class E 186 of the NS, as well as the class E 186 of COBRA. In addition, there were still the pure DC versions TRAXX DC for various privately owned transportation companies. In 2011, Bombardier finally presented the latest TRAXX generation – the AC3. From a technical point of view, there was little new, because merely new control software was implemented. The spectacular feature was the optional "Last Mile" function, a diesel motor that could be integrated later (Deutz 2013 BR-4V) with 230 kilowatts / 308 horsepower performance that could be used to bridge sections of track without catenary. This saves the use of a diesel switch engine because the AC3 can still reach up to 50 km/h / 31 mph and can pull trains with up to 2000 metric tons for eight to ten hours. Externally there are significant modifications on the AC3: ribbed side walls due to less costly construction. These walls can be covered with a so-called interchangeable Flex Panels (roll curtains made of canvas) and can thus be adapted at any time to the design wishes of the current operator. The move away from a smooth end shows the new GFK end module with the design, which is put over the end of the steel locomotive body like a mask. The DB is currently taking delivery of three classes: the 187.1 (without Last Mile for freight service), the 147.0 (regional passenger service), and the 147.5 (long-distance passenger service). The AC3 with "Last Mile" has recently brought several privately owned transportation companies and leasing companies into its roster, such as Railpool, which is currently leasing road numbers 187 004-008 to BLS Cargo.